When fall starts to roll in, leaves on the trees begin to change, the weather changes and you can best believe bass behavior starts to change as well. Once the spawn has completely finished and fish begin to branch back out away from the nest, a whole new world of fishing possibilities begin to unfold. Embrace the change and you’ll find the bass. The male bass have been guarding nests and fry for months and are starting to feed again for the first time in a long while, this is something you should definitely use to your advantage. The male bass are still hanging around the fry, which means seeking bass in shallow water. He has a job to keep his bloodline not only safe, but free from other bloodlines mixing in, so in other words, outsiders are not welcome! Knowing this, you need to work it by choosing bait they’ll immediately react to. Be the outsider! Pretend to be a small (1 to 2 inch) bass. Throw very small plastic swim baits that resemble the species of bass you’re targeting and toss them straight into the good of small fry, you'll be surprised how easily the father will spot the fake and "deal" with the problem. If you can't find the location of the fry, try working 3 to 5 feet of water around the edges, maintaining a direction parallel to the bank edge. New baby bass on the menu! Understand what’s trying to eat them, predator fish. Throw into the water body a larger, 7 to 9 inch lure, crankbait or swimbait that looks like one if its natural predator species. See what happens! Color is key! As the season changes, so does the water PH and temperature, often fluctuating. This will affect how the bass register color. Yellow to you, may look like dark green or even white to them, all due to PH and temperature. Instead of becoming a master in biometric pressures, weather patterns and meteorology, the best thing you can do is just try different colors. 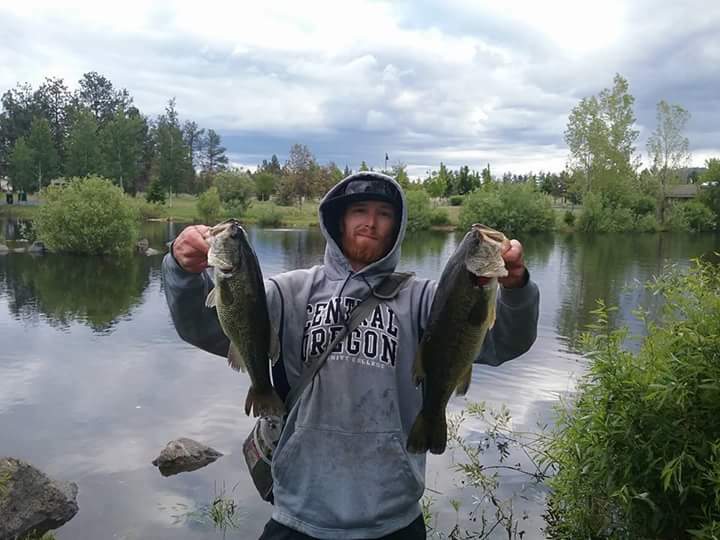 Keep a catch log and remind yourself year in, year out, month in, month out, what colors the bass respond to and in what water body during this time of year. Movement equals life! With falling leaves and wind blowing objects onto the water, movement is everything. During earlier months, the bass are in-tune to anything that drops or touches the surface. Now that they are seeing an abundance of movement on the water, they have begun to calm down and not respond to every little movement. So, LIVELY movement is very important. Make sure to throw and use movements that mimic swimming, squirming or wriggling motions and actions. This will get the attention of the bass better than baits you worked slowly earlier in the year. He is hungry! The male bass have not been feeding solid for a long time, so he’s worked up an appetite. Using a little larger presentation is always a good thing. Think about going to the grocery store while you’re hungry, everything looks good, too good. Your eyes are bigger than your stomach and you’ll probably end up buying more food than you really need. The bass have the same natural instinct. So, while bumping up the size of the swim bait or plastic, remember to change up the size of the hook to maximize its ability to stick! Another thing to keep in mind, bass tend to have a double-sided memory. Yes, I know it sounds crazy, but go out in the field and test for yourself. If you can, try to pay attention when you hook a bass, what side he was attacking from. A bass will most likely not attack on that same side after a break off. However, you'll notice that when the same thing is presented from the other side (or other eye on the bass), it’s almost like it’s the first time he's ever seen it! On a final note, with fall comes the intense colorful sunsets and sun rises. When fishing early morning or late evening, try and keep your silhouette from casting through the super lit up sky. This is a sure giveaway to a bass, it won’t make feeding impossible, but very very tricky. Checkout Deepers full line of products at our store.